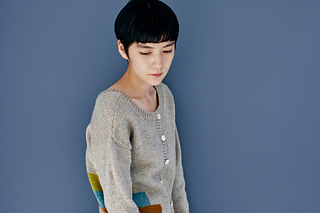 Tsumiki is a versatile garment, and is completely reversible. It may be worn as a V-neck pullover with the buttons in the back, or as a cardigan with the buttons in the front. 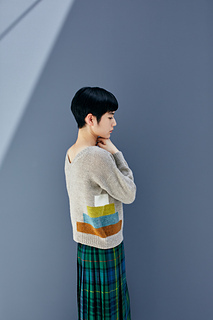 Simple intarsia block motifs wrap around each side of the garment and would look lovely in many different color combinations. Imagine using a gradation of colors, a spectrum inspired by a rainbow, natural shades, or colors that just simply work nicely together, as shown here.